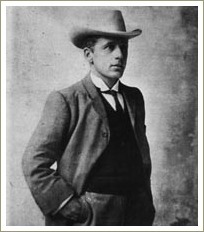 The Man from Ironbark is a very funny poem written by Australia's most famous bush poet Andrew Barton 'Banjo' Paterson. The poem was first published in an Australian magazine called The Bulletin on 17 December 1892. It was later included in a collection of Banjo Paterson's poems entitled 'The Man from Snowy River and other verses'. The collection of poems was published in October 1895 by Angus & Robertson which was then a newly-established company and it was an instant success. In Paterson's time, Ironbark was a small town on the Central Western Slopes of New South Wales, about 300 kilometres north-west of Sydney. It's name is now Stuart Town. 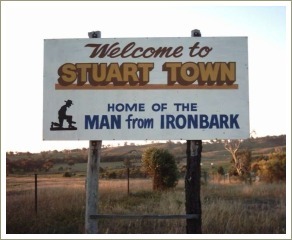 The area around Stuart Town is used mainly for cattle farming and for growing fruit but there was no town there until gold was discovered in the region in the 1870s. The goldrush lead to the building of a railway line from Sydney and the town of Ironbark was established. These days Stuart Town and the surrounding area has a population of about 300 people. I don't know what inspired Banjo Paterson to write The Man From Ironbark but he'd obviously heard the urban legend of the barber who murdered his customers. This is the story that first appeared in about 1846 in serial form and later as the tale of the notorious Sweeney Todd. The story was well-known in Victorian times so Paterson would certainly have read a version of it.